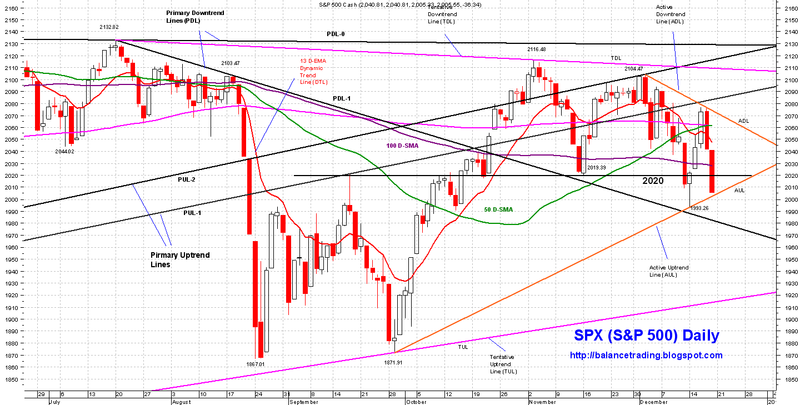 SPX is now trading below its 200, 100, 50 D-SMA's and 13 D-EMA. Last time SPX went below those moving averages was August 20 and then SPX sold off another 8% (8.25%) in the following three trading sessions. Chances of similar sell off happening next week is slim, the last two weeks of December are seasonably very bullish. My guess is that SPX very likely sells off early Monday morning to test PDL-1 around 1985, followed up by a one or two day rally to back test SPX 2000, AUL and probably SPX 2020 - 2040 resistance zone. After that brief rally, I expect selling to resume. Per my plan I opened my first of four short positions in SPY (I'm shorting only SPY) on Friday. 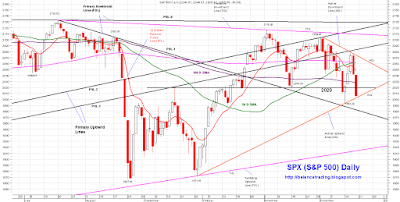 My plan is to open my 2nd short position sometime early next week as SPX rallies to test resistance range of 2020 - 2040. Should SPX continues selling without a counter trend rally, my plan is to add to my short position if SPX closes below 1970.